I’m trying to get a little fitter at the moment. I’m sporting a Jawbone and monitoring my steps. Drinking more water, and trying to get better sleep. I’m exercising plenty. But I had reached a plateau on my own and realising I needed a little help and guidance, have recently started working with a personal trainer. I expected the process to be difficult. I expected it to challenge me. I knew it was going to be one more thing I had to fit into an already loaded schedule. But I just didn’t expect it to make me think hard about how I coach. Me: My arm hurts from our last session. I think I’ve pulled a muscle. I need to take it easy today and not do any weights. PT: Is it warm to the touch? *He didn’t actually say any of these things. I reckon he might have been thinking them though. What he actually said was something far nicer. Something about seeing how we went on during the session and adapting as necessary. And then he made me get onto the treadmill. We did some cardio. I was really careful my injured, painful arm. You know, the one that was going to fall right off. The treadmill was followed by the dreaded step. Up down and up and down. And then he handed me some weights. Heavy ones, to hold whilst stepping. For a brief moment, I thought about clumping him around the head with them. He hadn’t listened to me. I wasn’t able to do that, not today. But of course I took them from him. Partly for me, because I wanted to prove that I could. Partly because I didn’t want him to think that I wasn’t strong enough. He had presented me with a gentle, silent challenge. Take the weights or find an excuse not to. Challenge the limiting assumption or give in to it. When we coach, we often find that people pitch up to a session loaded with reasons why and why not. Self limiting assumptions. Inbuilt beliefs. The defence mechanisms are primed. Justifications and excuses ready to roll. This process, this single session has made me think. Made me reflect about the amount of challenge I provide to people, and when and how to give it. We know that when people find their own solutions and their own answers to their challenges, they are so much more engaged than they would be with someone else’s words, suggestions, advice. My gym session provided the perfect example of theory in action. Instead of telling me that I could do it and loading me with the burden of his expectations and beliefs, he allowed me to find out for myself with his support. And in the end, he was right. There wasn’t anything wrong with me. But I needed to figure that out in the moment, rather than being told. I know that this lesson will live long for me. When I am in the gym, and when I am coaching. Somebody hand me some weights. I was recently delivering a coaching programme. We got to talking about how to really embed coaching within an organisation. What makes it really become effective, how to get the best from the style. The conversation turned to the role of senior leaders, and the extent to which their involvement is needed, or otherwise, in order to make a step change in approach. Whether it is embedding something like coaching, managing organisational change, introducing social culture – take your pick of the people stuff – the role of leaders is often talked about. Take social media. The CIPD research ‘Putting Social Media to Work’ confirmed its importance in legitimising the use of enterprise social networks within organisations. When it comes to embedding new stuff the role of senior leaders is important, and fulfils several roles. It gives permission that something is acceptable at your place, or a good use of work time. It sets an example, acts as a role model for behaviour. It can help move things forward more quickly than they otherwise might. It can provide heightened visibility or perceived value. But for all the benefits of senior leader involvement, it is just as important that its absence does not become an excuse not to do something. The role of senior leaders is embedding new stuff is important. But it is not essential. Take another example. The much maligned performance review. Whilst it is often criticised in its traditional format, we can’t deny that employees need feedback. They need development discussions, they need conversations, they need to talk about what is expected of them. It does work well when objectives are fully aligned across an organisation or to shared goals and visions. It works very well when objectives and plans flow down through an organisation. Senior leaders absolutely should lead by example by holding reviews with their own team, and holding them to account to make sure that they do the same. And onwards. But I have heard too many managers in too many organisations tell me that the reason that they haven’t taken the time to sit down with their team to review and discuss and feedback and set objectives is because they haven’t had their own review. That their manager hasn’t set them any objectives. Like this is some sort of acceptable justification. Just the same, I’ve heard plenty of people trot out the ‘it won’t work unless the senior managers do it’ line too many times. And here’s the thing. Senior leaders are busy folks. And sometimes they might just not do that thing that you hope that they might. Back to the coaching example for the moment. Coaching as a style is optimal when it is fully embedded within an organisation. When it becomes part of the everyday interaction between individuals. Part of the culture, top to bottom. That is the ideal state, but like with much people stuff, much organisational stuff, the ideal isn’t often the everyday reality. Or even close to achievable. But that doesn’t mean that it shouldn’t be done. During the discussion I said this. If you knew your manager was never going to adopt a coaching style, if you knew you were never going to be coached yourself, would that stop you? Should that stop you? If you knew that your team would benefit from coaching. If you knew that by coaching rather than telling you could help a person develop. Think well. Learn. Why wouldn’t you just do it anyway? Why would you wait for permission from someone higher up in the chain? Whatever it is you are trying to change. Whatever the people stuff you are trying to introduce. You can choose. Lead from anywhere. As long as you just lead. One of my favourite books is A Christmas Carol by Charles Dickens and I read it every Christmastime. I love the simplicity of the stories central message; that any one individual can make a choice to change their life, totally, completely. I’m sure that you know the story. Ebeneezer Scrooge was an unpleasant individual. He had devoted his life to the pursuit of wealth, the worship of Mammon. Once he set forth upon his path, this life view dominated everything. Activities that distracted from his quest were considered nonsense, frivolous, humbug. His love of money allowed him to justify ruthless, disgreeable behaviour, allowed him to act without any compassion or care for others. He was utterly unaware of how he was both despised and pitied by those who came into conact with him. Although few of us are as disagreeable as Scrooge, it is however extraordinarily easy for us to become as stuck as he was. Trapped in a behaviour and a mindset. As a coach and a mediator, I have often heard people say ‘that is just who I am’ or ‘this is the way that I do things’. Often, these discussions start with people in very fixed positions. Inflexible, unwilling to consider compromise or change. They have a viewpoint, and they are sticking with it. It is dangerous for us to think that we cannot change. It can lead us to make decisions, take particular paths and behave in certain ways, without sufficient consideration. It can be a justification, an excuse, a defence. It limits us. Scrooge was given the chance to change his outlook. Through being confronted with the shadows of his past, his present, and his possible future, he was given the opportunity to step back, to sit outside himself and look on, to reframe and rethink. The ghosts that visited him challenged him and forced him to face his true self. He made a choice, to change. This is what we do when we coach. We ask people to reflect, to stand back, to consider. We ask them to think about why they do things a certain way and to consider other options. As coaches we encourage self awareness. We present that opportunity of choice, of change, of new. We aim to make people resourceful so they are able to make those changes, those choices. When I am coaching, I often ask this question: ‘if you don’t do this, what will happen?’ Scrooge saw the answer to this. He would die alone, unmourned. unsung. Few of us fortunately have such an extreme probability. One of the most wonderful gifts we have is our ability to change ourselves, to start anew. Whilst there obviously is much about our lives that we that cannot, we are in control of our views, our attitudes and our beliefs. Our approach to the very life that we are living. We have choices. Change is possible. I wear the chain I forged in life. I made it link by link, and yard by yard; I girded it on my own free will, and of my own free will I wore it. This quote is taken from one my favourite books, A Christmas Carol, by Charles Dickens. The ghost of Jacob Marley explains the chains he wears to the miser Scrooge. 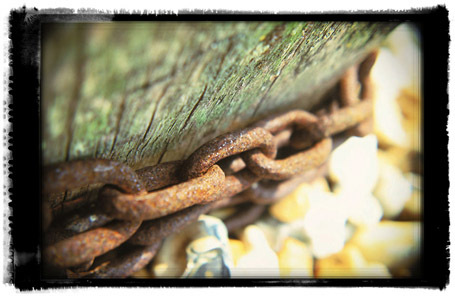 Chains that he made for himself, through his attitudes, his experiences, his behaviour. He was cursed to carry his chains for ever. I was re-reading the book at the weekend and it led me to think about the chains we all carry around with us, individually, organisationally, professionally. Our chains can take many forms, have many links. Unlike Marley’s chains they are invisible, but we lug them around with us just the same. They are self-limiting beliefs. Gremlins that live in the back of our mind and tell us we can’t, it won’t work, we might fail. Nagging doubts, questions, worries, fears. What-ifs and Should-haves. We won’t get the job, make the sale, pass the exam, hit our targets, complete the SMART objective. We are not good enough, slim enough, rich enough. The strength of a chain depends on many factors. Its length, construction, material, the amount of fatigue it is subjected to. Many years ago I worked for a chain manufacturer, and I know how tough chains are when they are constructed well, as many of our self-limiting beliefs are. We take our time to forge them, build them. But all chains can be broken, if they are subject to the right conditions, if the safe working load is breached. Marley was to carry his chain for ever, trapped by the past. But we are not. We have the ability to break free of those ties that bind us, the cages we construct for ourselves. We have the gift, if only we choose to use it. What chains are you carrying with you every day? And how can you break free of them?